OCRI is looking for a new leader. This may be the most important decision its members and funders make because it will set the direction for the organization during the coming critical years where Ottawa’s tech sector will either finally revive or fatally flounder. It’s a time for vision, inclusion, activism and leadership. So what should they look for? First someone who thinks regionally. Ottawa is a mid-sized city for Canada but tiny globally. The reality is that we compete with areas that measure their economic hinterlands in tens of millions of people – and we need to approach that scale to compete. It is this economic and geographic connection between producers and consumers that ensures needs definition and fulfillment easily link, creates ready markets for initial test, insures a large pools of investors and management talent, and guarantees a rich education and employee pools for specialized skills as businesses grow. If Ottawa’s tech sector is going to thrive OCRI must make Ottawa a central part of an economic partnership that extends from Windsor to Quebec City. Next the leader must be inclusive and strategic. A smaller tech community means smaller budgets – but the amount of work actually increases if “the current weakening trend” is to be reversed. OCRI must become an instigator when necessary and a coordinator where possible. It makes little difference to the strength of the community if The Code Factory mentors start-ups or whether OCRI does directly – except if the Code Factory handles it OCRI can focus on advocating public policy changes that few can address otherwise. Same goes for the Innovation Hub. Its fine in times of plenty to replicate MaRS in Ottawa but the budgets won’t be there for a number of years so let’s focus on delivering MaRS programs at University facilities’ using the telecom expertise Ottawa is famous for. Linking tech entrepreneurs within a university setting also provides (with some program support) a framework to bridge the commercialization gap that keeps so much Canadian funded research in the lab instead of the market. The next bit of inclusion is that OCRI must reach out and address the needs of the thousands of small tech companies that are not currently it members or risk seeing its public funding attacked as this group develops an independent voice and representation. The new leader must also be an activist. The problem of start-up investment or talent pools is not just a function of our size. We need substantial changes in out tax structures if we are gong to compete with the rest of the world. I’m not talking about lower corporate rates but of correcting the putative options regulations that mean start-up can’t attract world class talent with promises of future gain, and the write-off rules that reward people for keeping money out of high risk/reward investments like tech. We also need to look at federal and provincial programs that are sometimes so rule bound as to be meaningless. Lets make sure that if other levels of government understand the problem that their programs address it effectively. It is in developing the expertise here, and using our proximity to the federal government – that OCRi cements its leadership role to eastern Canada’s tech community. This is a defining moment for OCRI. I hope they will consider these issues as they evaluate candidates. Sure it’s easy to say that we’d do better but the sad truth is that lots of companies and industries struggle when presented with business models or technologies they don’t understand. The problem you need a frame of reference to evaluate options and many companies don’t have a broad enough one because they haven’t built the connections outside their immediate company and industry as a hedge to track and understand real or potential scenarios. That’s compounded by the fact that most companies have cultures that arbores failure so if problems emerge it’s more sensible (on an individual level) to do nothing than to do something wrong. The antidote as John Hegal argues is institutional innovation which produces long term value because it aligns with global and macro trends and encompasses process and product innovation. Institutional innovation is at its core a cultural process built on diverse trust relationship within and outside the company and organizational structures with enough modularity to allow process experimentation but enough cohesion to facilitate decision making. It’s also a process that builds on the extended networks that emerge with a region and between companies, their suppliers and customers. It’s developing these into trusted relationships that allow the flow of information that lets industries identify the expertise needed to develop strategic approaches to changes in their marketplace. One of the reasons I’m interested regional economic development is that I believe that Institutional Innovation can be encouraged and could become a competitive advantage for the regions that adopt it. That’s also the reason I’m interested in connecting BarCamps as we did with Leads. There already is a common cultural framework, and an easy means of identifying influencers in each region. And for many of the small companies extending their network reach both conceptually (which is why they participate) and geographically would be a competitive advantage. These are going to be exciting times – from restructuring in the media/social media and open source, to globalization new models and opportunities are emerging for companies and regions that structure themselves to take advantage of them. Just in time for Christmas there is exciting news from Ian Graham – the Code Factory is a go. If you’re not already familiar with the CodeFactory think shared facility offices meet BarCamp. It’s this mix of private office space, open work space and community events that set the CodeFatory apart. Of course productivity is at the core of any shared office facility, and the CodeFactory provides this in spades. First the shared facility offices are all about concentrating on your business – without having to think about your office. Teams can start and grow without once having to worry about outfitting their offices or finding new facilities as they grow. If that was all the CodeFactory did it would be useful – but it does the same thing for individuals and for groups providing an environment for permanent and occasional work and group meetings. It’s hard not to think that connections and knowledge will flow helping the entire community at the same time as it provides members unique insights and opportunities. It’s a new approach that recognizes that while business was always about relationships it increasingly will be from the quality of your network – because that connects you to people, ideas and opportunities outside your personal knowledge. The CodeFactory builds the network of every person involved benifiting the entire community. If this sounds interesting to you contact Ian at ian . thecodefactory at gmail dot com. With apologies to Buggles – whose 1979 hit remembers the golden era of radio while celebrating the unrelenting force of technology to re-shape media. It’s TV’s turn now. Web & Social video are set to reshape both media. Locally stealth start-ups Overlay.tv and FaveQuest are playing in this area, as are local content producers like RaceDV. What’s happening locally is echoed elsewhere with video producers and aggregators/sharing sites opening daily it seems. 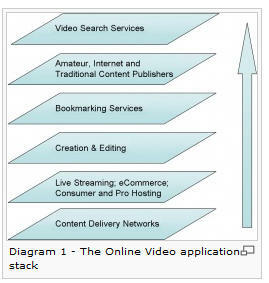 Each of them focused at different areas of the video sharing stack. As everyone who’s looked at this area knows, viewer ship is exploding and with it ad revenue, and influnce. 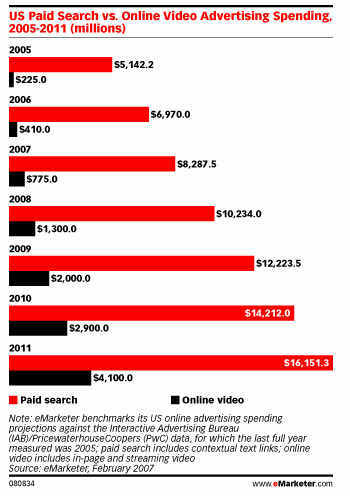 In fact some commentators believe that the web will overtake TV as the major source of ad spend. For that to happen the web has to attract brand and product positioning advertising – not just transactional advertising. Viddler’s original technology – in video commenting is incredibly powerful because it allows community to develop even as the video spreads from site to site through viral embedding. The ad technology is a logical extension of that. What also isn’t clear to me is the business model – because I believe they are focusing at the wrong point in the stack. As I see it they believe these features will drive people to their site both to publish and consume video. I’m not so sure. I believe that web video will, like blogging before it, will move from individual user generated content to pro-am and organizations dominating niches. These sites will be in direct competition for advertisers and viewers – not just with other web based services but with TV as well. As Viddler demonstrates for ad delivery, and RaceDV does for niche user generated content, the advantage the web services have is that they innovate on numerous levels that TV doesn’t stand chance – because, as the Buggle’s sang “we can’t rewind we’ve gone too far”.